Since 1878 Stockholm University has been characterized by openness and innovation. A modern university with a multicultural environment, Stockholm University is one of the world’s top 100 higher education institutes. Here more than 60,000 students and 5,000 staff are active within science, the humanities and the social sciences. Education and research at Stockholm University make a difference. The University contributes to individual and social change through top quality education and outstanding research. Our researchers contribute to the development of public policy and political decision making, and participate in Nobel Prize Committees and international expert bodies. Stockholm is a cultural hub and economic centre, with many green areas and surrounded by water, making it an ideal place in which to enjoy a relaxed and exciting student life. Stockholm University makes knowledge accessible to all through dialogue and active participation in public debate and social development. A relationship with Stockholm University is valuable whether you are a decision maker, former student or if you meet us in another way. The University’s researchers are engaged in all aspects of society, and participate in governmental working parties, in the media, as consultants for proposed legislation, in the Nobel committees and in international expert bodies. The main Stockholm University campus, known as Frescati, is situated north of the city centre. A small number of departments are located outside of the main campus. These include the Department of Cinema Studies, the Department of Journalism, Media and Communication (JMK), the IT University (in collaboration with The Royal Institute of Technology) and Campus Konradsberg where some parts of Teacher Education are currently located. At Stockholm University there are approximately seventy departments and centres within the Faculties of Humanities, Law, Sciences and Social Sciences. The Department of Education is a large and educationally-strong department, which, in recent years, has successfully integrated a number of activities. Today it is a fully unified department working very much in the same direction. Another educationally-strong department is the Department of Social Work, also known as the School of Social Work, with extensive educational programmes within the field of social work. The department also works closely with various stakeholders in the sector, and the department’s lecturers and professors, in addition to their research, are also frequently called upon as experts. The department is located at Sveaplan, until premises at Albano are available. The Department of Economic History is a small but well-functioning department which maintains close collaboration with similar institutes around Sweden. On the educational side, the department has pursued a strong proactive line in relation to the Swedish Higher Education Authority’s evaluations. The academic area of international relations is also a subject within this department which is in very high demand. In addition the Department coordinates a newly established, cross-faculty graduate school in international relations. The Department of Computer and Systems Sciences (DSV) is the University’s largest department, with extensive teaching prgrammes and established international educational collaboration. The Department has a strong entrepreneurial character, with broad collaboration, with amongst others, technology companies in the surrounding area. DSV is in the forefront of e-learning and sees this as a resource for the entire University. Another area that has been in focus recently is that of technology and art. The connection to working life is also very well developed in the courses and programmes delivered by the department. The same also applies to the highly popular programme at the Department of Political Science. The department offers students the chance of an internship, usually during the last term, as they often go straight from practice into the workplace. Political Science in Stockholm is also a very strong research department. Research areas include global and regional governance—one of the University’s leading research areas—and the department has the largest research group within social science-based environmental research. Research at Stockholm University within science and the humanities and social sciences is outstanding in many areas, contributing both to the understanding of the world around us and to its continued improvement. Its research maintains a high standard within a wide range of subjects, enabling our researchers to develop an increasing cross-disciplinary cooperation. Many of the University’s research groups find themselves at the cutting edge of their field of inquiry. Thirty research areas, each nationally-leading and having a high international status, have been specially chosen to profile the University. Stockholm University has a long tradition of holding public lectures. Many departments hold lectures, seminars and conferences that are open to the general public and free of charge. 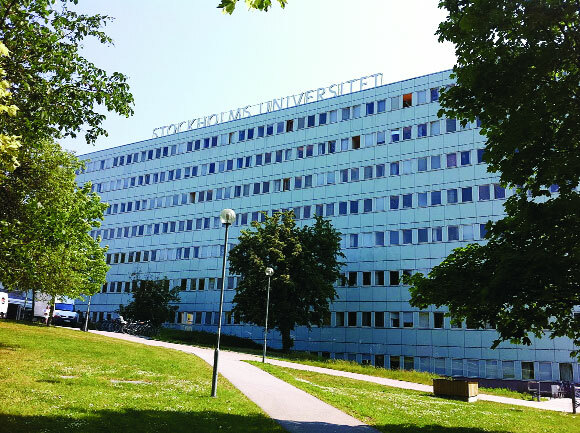 The scholarship scheme at Stockholm University is aimed at especially qualified students coming from countries outside of EU/EEA/Switzerland and who are required to pay tuition fees for studies commencing after June 2011. Please note that only scholarship applications from students admitted for a Master’s program commencing in the autumn semester at Stockholm University will be considered. Priority will be given to students with Stockholm University as their first choice in the national application rounds. Stockholm University scholarships cover tuition fees only, which means that students will need to cover their own living costs. If you wish to start at postgraduate level towards a PhD degree (and you meet all the requirements decided by the department concerned), Swedish language skills are not necessarily a requirement, but definitely an advantage. You will however need to be fluent in English. The academic year at Stockholm University starts in late August and ends in early June. It is divided into two semesters or terms: autumn and spring.